At St George’s College, our first commitment is to the safety and security of our guests and our staff. 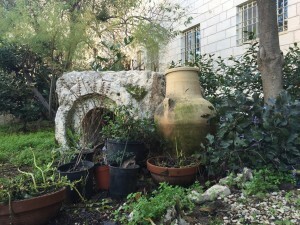 The College is located within the Close of St George’s Cathedral in East Jerusalem, just a couple of hundred metres north of the Damascus Gate. The entire complex is enclosed to create a secure and pleasant environment, including the biblical garden that surrounds the College and the English garden that sits in the centre of the Cathedral’s Pilgrim Guest House. The two gates leading onto the city streets from the Close are monitored on camera and in person 24 hours a day, 7 days a week by our security personnel. Our immediate neighbours also add to the security of the College and the Close, even if not intentionally. The Israeli Ministry of Justice building for East Jerusalem is located on the southern boundary of the College. The Jerusalem District Court is directly across the street from the College gate. When planning our study pilgrimages and on day-to-day site visits, we always give special attention to any places that may be experiencing tension. Our local Palestinian staff draw on their contacts to keep us aware of any issues likely to affect College programmes. For this reason and also because some sites are unexpectedly closed, occasionally we need to make a slight change in a programme. Fortunately this task is made easier by the vast number of rich and relevant sites to include. The experience of course members over the past months mirrors the experiences of pilgrims who have come here over the past several decades. The Cathedral Close is an oasis of peace and security in an occasionally tense city and its environs. Some people find the armed military and police presence noticeable and even uncomfortable. But by the end of their pilgrimages, College groups usually note how different—more quiet and secure—Jerusalem and the Holy Land felt than they had anticipated.